Graham Manou will add some one-day international appearances to his Ashes Test after winning a promotion to Australia's team in India following Tim Paine's broken finger. Manou was due to fly to Delhi on Thursday night and will land in time for the third match of the seven-game series on Saturday. He was watching movies instead of the cricket on Wednesday and woke up to text messages from friends hoping he would be picked. He went to state training as usual and ran into Jamie Cox, a national selector, who told him to head home and pack for his first visit to India. "It's straight into the cauldron of one of the toughest environments in world cricket," he said. "It's going to be a fantastic challenge and hopefully I can learn from it and bring the experience back to our group." He will also be able to pass on some tips to his partner Tamsyn Lewis, the middle-distance runner, who is looking towards the Commonwealth Games in Delhi next year. "After this experience and the Ashes, you could say you could be pretty happy, but I'll certainly be wanting more," he said. "Fingers crossed this part of the tour goes well." Manou, 30, is a Cricket Australia contracted player and his elevation should allow Shaun Marsh to head back to the top of the order. Paine has done well in his opening opportunities, preventing a quick return for Marsh after a series of hamstring injuries. He fractured a ring finger taking a Peter Siddle delivery in the 99-run loss to India on Wednesday before managing 8 in the second innings before learning he would be going home. "Graham richly deserves this opportunity following his Ashes debut and his successful domestic season last year in all forms of the game," Andrew Hilditch, the chairman of selectors, said. 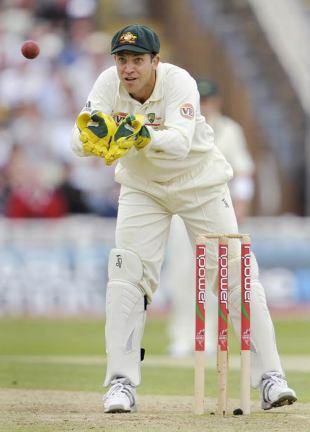 The main competition for Manou came from Chris Hartley, who was called to play a tour game in England when both Haddin and Manou were injured. Hartley has started at the top of the order in Queensland's past two FR Cup matches and posted half-centuries, but the selectors have kept faith in their original pecking order. Manou, the South Australia captain, has elevated himself to No. 4 in their limited-overs contests this summer, falling for 2 and 34. Haddin is not quite ready for international responsibilities after finger surgery following the injury he picked up in England and will play instead in a one-day match for New South Wales on Sunday. "It is premature for Brad to resume cricket for Australia," Hilditch said, "having not played first-class cricket since The Oval Ashes Test." Paine's injury adds to a horror run for the Australians, who have concerns over Brett Lee and James Hopes, and had Michael Clarke, Nathan Bracken and Callum Ferguson unavailable for the tour.